For my 500th contribution to these forums I figured that I’d finally get around to writing a review of my ETC Congo Kid – something that I’ve hinted at writing for quite some time. Given the highly involved and rather complex nature of the Congo Kid and ETC’s Cobalt Server in general, I figured it’s best not to dive into each and every feature that the product offers, but instead present my journey of what led me to choose the Congo Kid as my go-to desk for personal inventory when supporting “medium” sized shows and events. As a reference point, this purchase was made just before Christmas 2014 and I’ve been using the console ever since. I’ve added a few photos to keep things interesting, but as a disclaimer, light/sound/pyro is my area of competency – not photography – so please excuse any photos that could have been taken better had I known what I was doing! To start my story with some personal background, I’ve been a lighting tech/designer/programmer for nearly 20 years now and have worked on desks of all sizes, makes, and models. Most of the work I do is freelance, either being hired in to design on someone else’s system or to supply my own…sometimes a bit of both. My training is largely theatrical with some “live music” thrown in as well. Early on it became apparent that in order to properly grow my business and serve my customers I needed some sort of personal light console to travel with as required. At the time (10+ years ago), purchasing a name-brand desk from makers like ETC, Strand, and HES wasn’t an option due to the lack of justifiable budget for such an investment. To bridge the gap of form, function, and price I adopted the MagicQ PC platform via a laptop and an Enttec Pro interface. 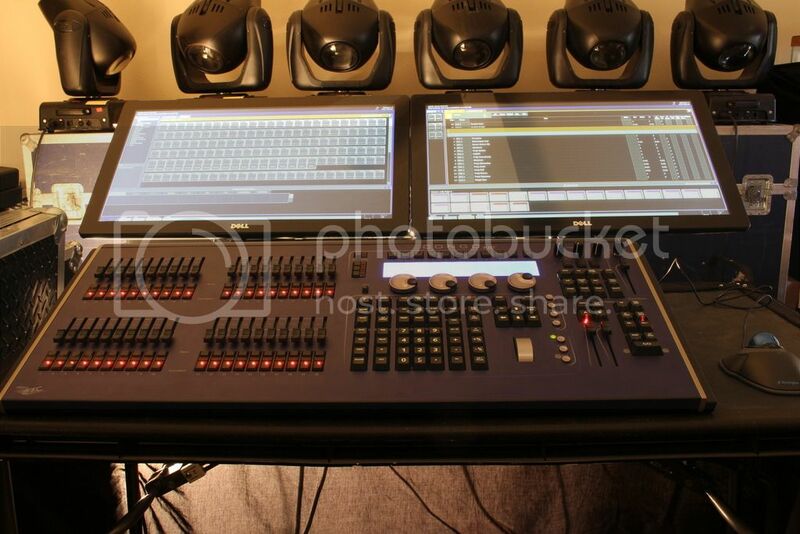 To get me “hands-on” control of select lights I also continued to use my Behringer Eurolight as needed. 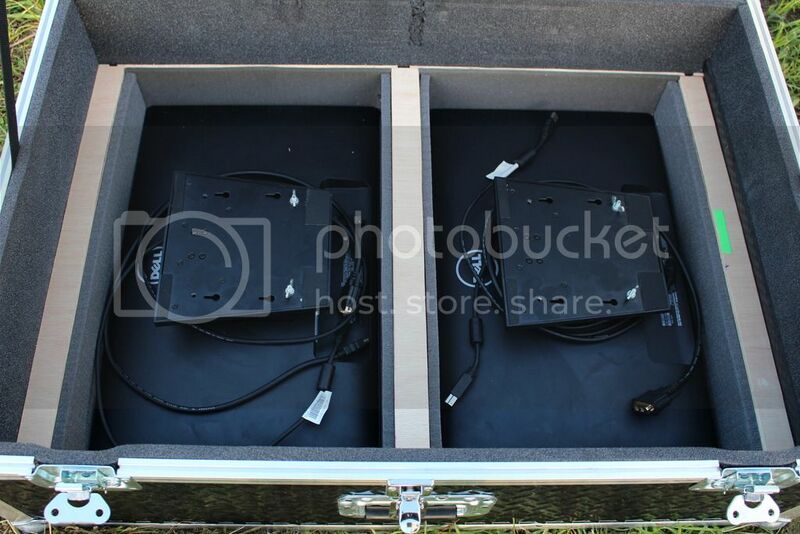 Keep in mind this was before LED lights really had a presence in the market, so using the pair in tandem worked out okay – the Eurolight for my conventionals and effects, MagicQ for my movers. I used this combination for nearly a decade until mid-way through 2014 when it was clear the time had finally come to buy a “real” board. Not that MagicQ PC doesn’t count, but with the scale of my jobs building (along with the following revenue) the need was there to have a more capable solution in personal inventory. Define more capable… My personal requirements for the solution were to have at least 2 full universes of DMX on board, plentiful buttons/faders, timecode playback (SMPTE or MTC), and multiple monitor support, ideally touchscreens. The console needed to be equally at home in a theater (with “GO Button” playback) as well as with busking a live concert or event. It also needed to “look” professional and not be a MIDI-hacked style of solution…nothing against them. The need for a better physical interface would probably be the one sole reason for justifying the upgrade. I gave myself a budget of 5K, understanding that this could grow or shrink depending on where the best bang-to-buck would be found and how that compares with my requirements. The first natural approach I considered to satisfy my needs was to simply augment my MagicQ PC platform. I already knew the software pretty well, and all of the necessary products existed to get me what I wanted. 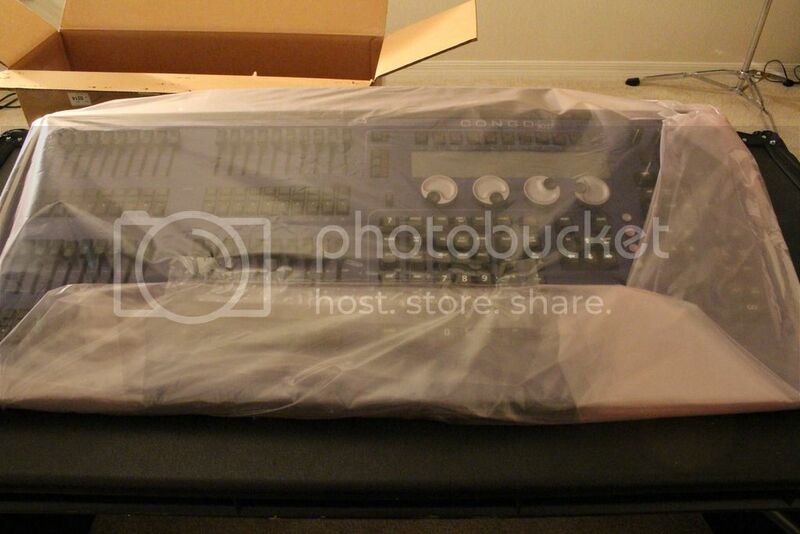 I went ahead and priced the whole purchase out – a Rackmount PC, Eaton UPS, one of the ChamSys Wings, the MIDI/Timecode Interface, a rack, fold-out touchscreen, and all of the necessary peripherals. All said and done, the total cost would have topped 3K. I understand what that would have gotten me, and while it was still within budget it didn’t completely hit all the points I wanted (primarily the “plentiful buttons/faders” requirement – which was one of the driving factors behind this upgrade) nor did I feel that it was particularly great bang to buck. I’m personally not a huge fan of the M-PC with M-Touch as a suitable console substitute either, not to mention that the M-Touch product was still in development during the timeframe I was shopping in. Phil from ChamSys USA was a pleasure to work with while helping to price out my options but in the end I just didn’t feel that this was the best route for me to pursue. This led me to consider a few actual hardware desks against the aforementioned MagicQ PC option. 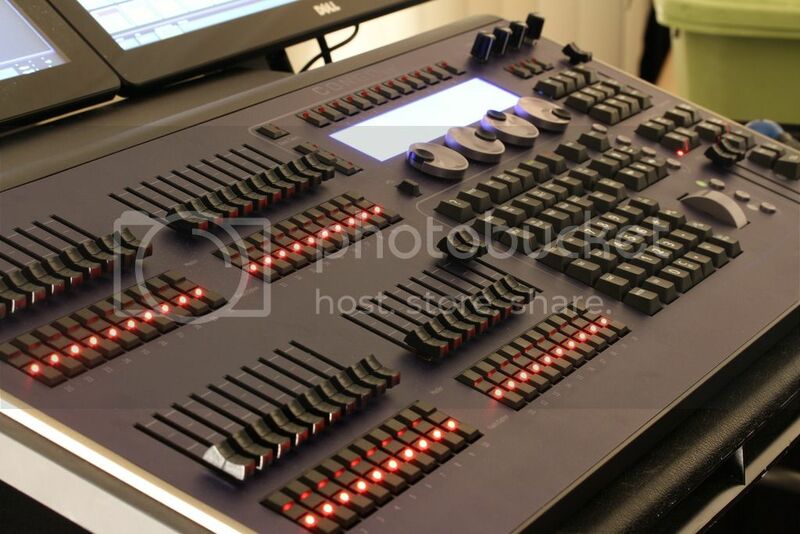 Similar to software options, there seems to be no shortage of hardware options for light consoles either. Keeping budget and needs in mind, I started to pare down the choices before requesting demos in person. Coupling my prior experiences with certain products and what I was shopping for, I decided to take a look at ETC’s SmartFade and Congo/Cobalt series, a few of Strand’s offerings (200 Plus, 250ML), and the Jester/Solution/ORB Series from Zero 88. I already had experience with ETC’s Eos/Element/ION, so I didn’t really count that as a console needing to demo. Now yes, you can’t possibly compare an ETC SmartFade to an ION – two completely different desks with different applications and pricepoints, but I was shopping for the best bang-to-buck and wanted to keep all options open. While the SmartFade and Strand desks wouldn’t check all the boxes outlined in my requirements above, for their price it was at least worth a look. The ColorSource Series had not yet been released. Luckily for me, living in the Central Florida area means that I’m only an hour or so away from almost any given major manufacturer, so demoing consoles wouldn’t be hard. This is probably the most logical place to add that after investigation, neither the Strand nor Zero 88 options really felt like a good fit for me either. While the 250ML was a nice change of pace from the more heritage Strand 300/301 Series that I had prior experience with, my biggest issue with Strand’s consoles continued to be a lack of coordination between the hardware and software. I guess you could call it a “workflow issue”, but in general the keystrokes were awkward, button placement wasn’t really thought out… It’s like the software and hardware engineers didn’t integrate their products properly. While some might not take the “Human Factors” part of a console very seriously, when you’re working on a desk for hours without break, having to reach across the console every 5 seconds to hit a button can really be a pain, literally. My downfalls with Zero 88’s products were a lack of widespread availability in the United States and a rather outdated software architecture in their products. I paid a visit to ETC’s regional office in Orlando with an appointment to see the SmartFade and Congo/Cobalt Series. I know that ETC will generally travel to your location as well, but given that I’m a mobile operator it made more sense for me to travel to them. The representative that assisted with the demo (Steve) definitely lived up to ETC’s reputation for legendary support and service. Over the course of 2-3 hours I was shown the products and had no shortage of time to play and ask questions. The environment was very casual with the full time being 1-on-1 with Steve and the products. We also added the Element to the demo lineup just for comparison purposes when looking at Cobalt. What impressed me most about the demo was that there was no pressure from ETC to buy the most expensive product in the room. It was all about getting me the right product for my needs…even if it wasn’t an ETC desk. Also, being a younger guy just working for myself, I was still taken with full seriousness and treated as a respected customer despite the fact I'd fit the profile of someone just window shopping for nice products they can never afford. So my thoughts about the different products… Starting with the SmartFade, I knew that this was a product targeted for smaller and lower-budget jobs. It’d never compare to an Eos or Cobalt desk. Even then, the board felt a little cheap to me (button quality, etc.) and it was still a rather limited product despite a $1000+ price tag. 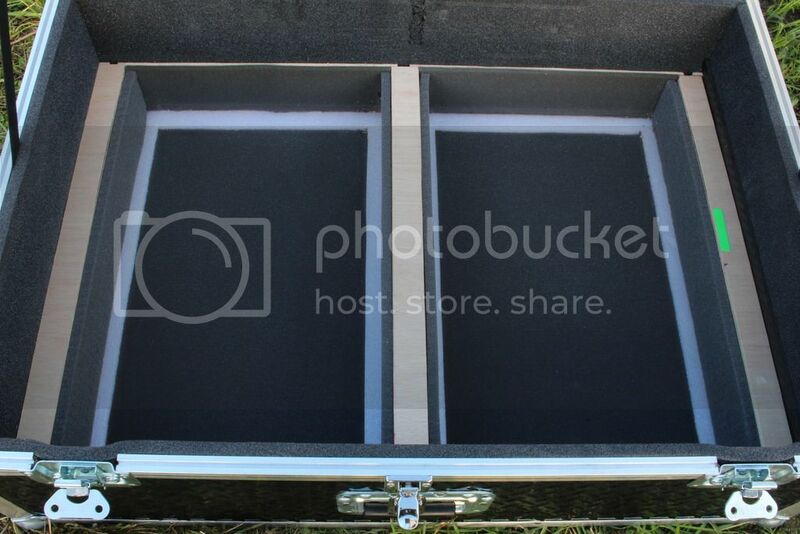 I would have guessed it to be an Elation or Chauvet desk if not for the ETC label. The one neat takeaway with the SmartFade Series is the ability to pair it with a computer or laptop running SmartSoft. It’s kind of like a wing, but in reverse. I felt this really helped to open up the board and make it feel bigger than it really was, but otherwise this would have been a step backwards from the level of controller I was currently using and not really worth the money. Looking back on this experience, I feel that the ColorSource Series does a much better job at being an “Entry Level” console that carries professional features at a somewhat budget pricepoint. Being 2017 now I’m surprised the SmartFades are still relevant on the market, but in the right application I’d have no gripes about using one. It appears that ETC has recently discontinued the SmartFade Series. There is no shortage of user reviews on ETC’s Eos/Element/ION product, so I won’t speak much to them. Even after playing with one (again), they’re nice boards but definitely more suited to theater and scripted playback. Those coming from the Express or similar will certainly enjoy the added horsepower and better device handling of the Element (and certainly the ION), but they weren’t the boards for me. So finally working my way to Cobalt…in short I was blown away by the desk. I had already done considerable research and reading on each product prior to the demo so that I could get the most out of it, but even still the immense capabilities of the console were quickly apparent. Up until this point I have been using “Cobalt” and “Congo” somewhat interchangeably. In truth, the way this ecosystem works is that Cobalt 20, the Cobalt 10, Congo Jr., and Congo Kid consoles are all part of the Cobalt Family. They all run the exact same Cobalt Server. The only difference is the physical hardware and output availability associated with each product. Even ETC’s Nomad product can run Cobalt. What makes this such a huge benefit is that not only my physical shows but even just programming skill can transfer seamlessly between products. I can travel with a physical desk when budget and logistics allow, yet field a Nomad PC solution when just needing to travel with a laptop! Now, most big-name consoles can do this too, but it’s still nice to have such flexibility. Getting back on track here, the actual board I demoed was the Congo Jr. with a single fader wing. 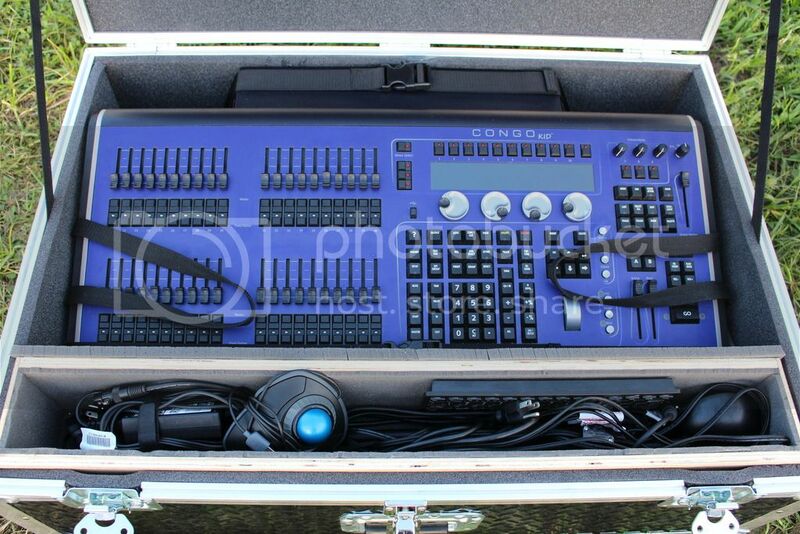 The Congo Kid is similar, with the programming section and fader area merged into one board. There are minor differences between the Congo Jr., Kid, and Cobalt desks such as scribble strips, physical buttons, motorized faders on the larger boards, and a few other things, but at the root level they run the same software. All of this power comes at a price though. Cobalt is not a beginner light board. While I was able to pick up the syntax pretty quickly, I would strongly think twice before putting this in front of a volunteer or student with minimal prior experience. To begin with, the syntax is nonstandard. Most of us with lighting experience will recognize  [AT]  [Enter]. That’s assuming the board defaults to channel selects. Otherwise, it’d be [Channel]  [AT] <0> [Enter], assuming the zero is optional. Try this on Cobalt, you’ll get an error on the first button push. The proper syntax for the same command on Cobalt is  [CH/ID]  [@Level]. How about the usual [Record] <Cue>  [Enter]? On Cobalt, it’s simply  [Record]. See the trend? Each line of syntax on Cobalt usually removes at least one keystroke when compared to more standard syntax. This is called Reverse Polish Notation (RPN) and is seen on certain adding machines and similar, again for the intent of increasing user speed. This is evident by the board’s lack of an [Enter] key. The slight reduction in keystrokes may not seem like much, but when you’re trying to hammer out a full musical or program a show with only an hour to house opening, the fewer keystrokes really adds up. RPN applies to all commands within Cobalt. A slight disclaimer to this is that Cobalt features a setting called “At Mode”, which suppresses some of these keystrokes to act more like industry-standard syntax. I haven’t played with it, so no comment from me but given that the desk was built around RPN I’d strongly suggest learning it if intending to use the product to its full potential. Detailed features aside, the other really nice thing about this console is how well it can handle both theatrical playback as well as the busking work. Because the desk stores content much like a busking console (essentially a library of “looks” that can be called upon as needed), building up the usual cue stack for a musical is much easier than one might be used to if coming from the older Express mentality. Much like creating a playlist from the music library in iTunes, all one needs to do is build each “look” only once, and then drag-and-drop each scene as needed into a Sequence to make a show. Updating is as simple as just modifying the one “look” in question – all the changes track through the Sequence automatically (and anything else that references that “look”). Gone are the days of Copy/Paste for repeat scenes as well as picking through a track list for inconsistencies. Cobalt will still let you do that if you really want to though… Most other content can also be dragged and dropped to speed up programming even more. Effect handling is another huge strength of the board. You can still program basic “effects”, but the Dynamic and Content Effects are really where the console flexes its muscles. You’ll really appreciate these when programming movers and LEDs. Thanks to the power of Content Effects, programming complex sequences of movement, effects, and color changes can be done in no more time than it takes to program an “old school” effect, if not less. Really a nice unit that blends the hardware and software aspects of the board perfectly.The buttons and faders feel solid and high-quality on the desk, and the layout has a nice ergonomic feel to it – one of my gripes about many Strand consoles. The programming buttons have decent travel and the solid press of something like a PC keyboard (something I like), while the Flash/Master buttons are tight and responsive – exactly how you'd want them. While the buttons aren’t silent, I much prefer this type of button versus the silent rubber buttons found on other desks such as many of Strand’s offerings. Adding your own touchscreens are a nice bonus with the Congo Kid or Jr., though I find myself using the trackball mouse most often – only touching the screens when using multi-touch gestures (selecting groups, etc.). So all that said this board felt right and I made the purchase. I bought the “256 Channel” version. Now, it’s important to understand how ETC allocates “Channels” and “Outputs”. There are two versions of the Congo Kid available – the 256 channel variant and the 512 channel variant. But I thought 2 full universes was the minimum requirement for this purchase? Well, it is, and both versions meet that. To put it somewhat simply, ETC treats “Channel” like “Device” and “Output” like “DMX Channel”. Each “ETC Channel” can be anything from a single channel dimmer to a Mac 2K. In my case, I’m limited to 256 “Devices” and 1024 DMX Channels. The board’s capacity is reached when I hit either one. The 512 Channel variant would be limited to 512 “Devices” and 1024 DMX Channels. In short, unless you plan on using hundreds of dimmers, there’s no sense in buying the 512 channel variant. This is what the ETC Representative told me, and once I wrapped my head around that it made sense. As a side-note, this isn’t an ETC-exclusive nomenclature, but it’s easy to get the concept confused if comparing to other manufacturers, particularly those who make “lesser” boards. 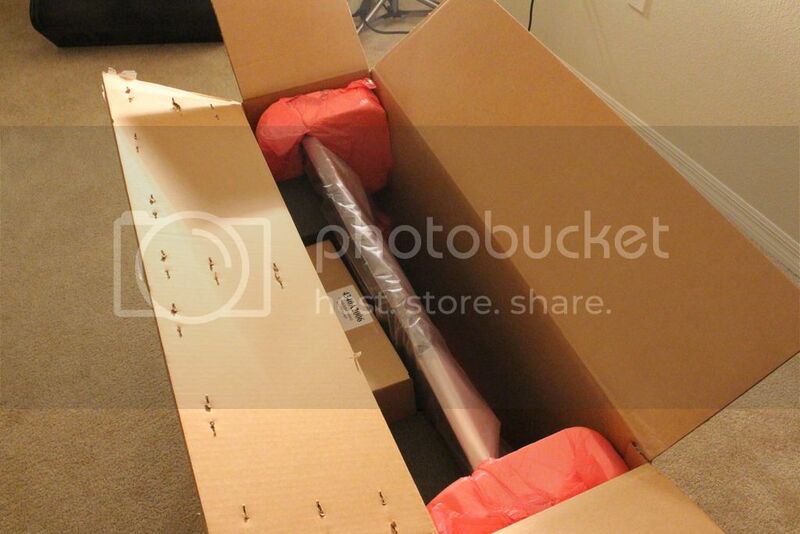 Yes, taking advantage of the holiday season I waited to unbox the board on Christmas. Packing was superb and the build quality of the console itself was solid, as expected. An accessory kit was included with things like an ETC mouse with mouse pad, an ETC thumb drive, a dust cover, power cords, and all the board’s paperwork. Aside from my excitement with the new toy and big smiles while watching it boot up for the first time, there was nothing to be surprised over. The console was exactly as ordered, worked out of the box as intended, and had ETC’s world-class support backing it up. I had no hesitation making the purchase, and even though this board is still on the smaller end of what ETC’s product line can offer I still felt treated like a high-priority, valued customer. The console was pressed into service less than a month later and has seen routine, regular use ever since. In addition to the console itself, I purchased a pair of Dell 23” multi-touchscreens, folding stands for said touchscreens, a trackball, and a keyboard. Given that the console runs Windows 7, any Windows 7-compatible devices should be supported without issue. Set up as pictured below, I have no trouble seeing over the monitors and the arrangement gives me room for the mouse and a script next to the console, all fitting on a 4ft folding table. I wanted to transport all this in a single roadcase as well. 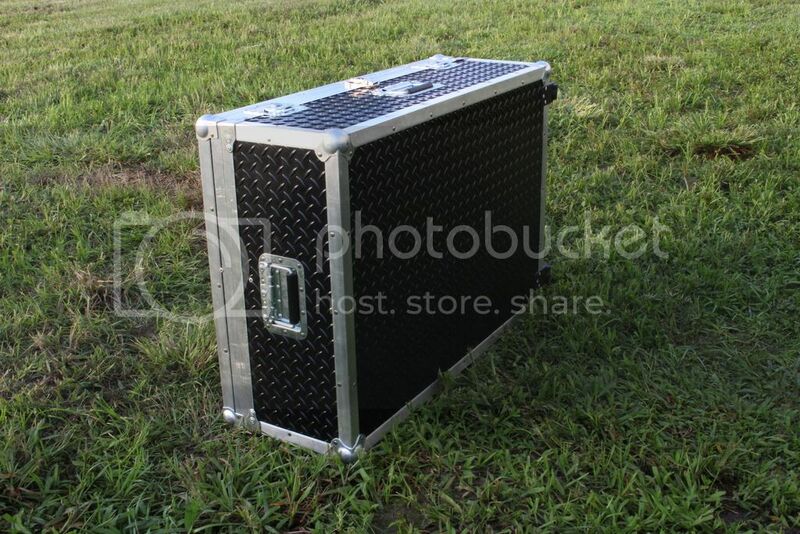 At the time, RoadCasesUSA was running a decent sale on the case pictured below, and by working with their friendly representative we were able to put together a custom case that would meet my needs and still qualify for the sale pricing. Of course this was just for the shell, so upon arrival I fabricated the inside supports and trays to hold all the miscellaneous parts that make up the full console. The whole thing ended up a bit heavier than I might have liked, but it gets the job done and has held up perfectly 2+ years later. All said and done this investment cost me between 5 and 6K, and that’s thanks to some thrifty shopping and good dealer relationships. Not being an ETC dealer myself I can’t confirm this, but it appears that the price of this board has gone up a bit since the release of ColorSource. Honestly though, for the given application I don’t think one can do better in the sub-10K price bracket and even with a slightly higher price now the board is more than worth it.Thinking back almost 3 years later I’m confident I got the purchase right. I don’t really have any “cons” to gripe about with this board. Its reliability has been rock-solid. If I had to list one “I wish it had…”, it would have been nice for ETC to include blacklit buttons and scribble strips on the Congo Kid as they do on the higher-up Cobalt desks. Even having used consoles with both, they still don’t save me from using the desk light and spike tape…they just look nicer. Since the Congo Kid has 40 faders, I don’t find myself flipping to “Page 2” for faders 41-80 often if at all so the scribble strips serve less of a utility when compared to something like a digital mixer where functions are spread across numerous fader pages. 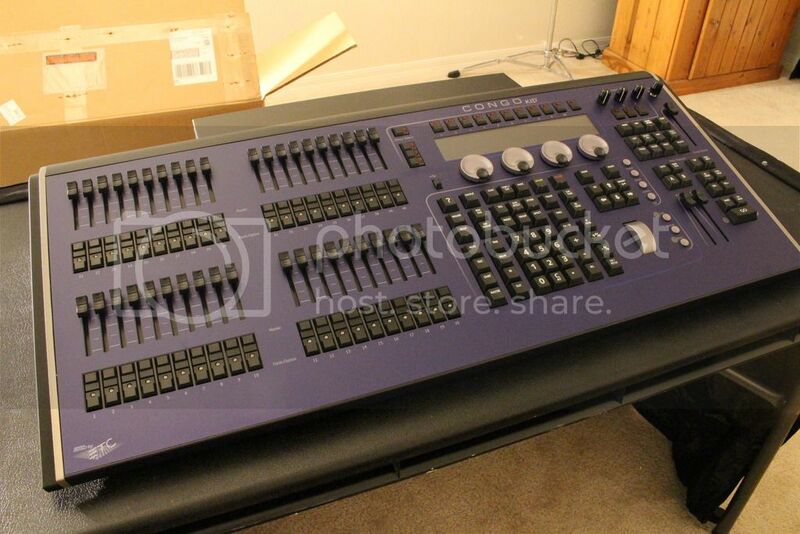 Of course at that point I’d want motorized faders too, and we’re now beyond a 10K desk… The only caution I give to potential buyers reading this is that these boards aren’t very common in the wild. If you’re a sole owner/operator like me this is rather irrelevant, whereas if you plan on touring or renting the console this might not be your best choice. Most rental shops don’t carry the Cobalt Series, so fielding a replacement at your next tour stop might be tricky. A rental shop would probably be better served with a more mainstream desk that will see higher demand such as a Hog, grandMA, or ION depending on your market served. Schools and churches would probably be best off with something a little more approachable such as an Element or some of the offerings from Jands and Pathway. So that’s my review, thanks for reading! In summary, Cobalt is a rather niche product that doesn’t see the love or use that the Eos consoles do, but in the right application it can really be a superstar. It’s not a product for everyone, but for those willing to learn the syntax and really put it to work I think they’ll be very happy with this solid product from ETC. Hey Jeff - I have been meaning to say that this is a great review. I looked briefly at the Congo Kid 4 or 5 years ago and I can definitely see the appeal. At the time the price tag was a problem for me, so I stuck with the SmartFade ML until the Martin gear happened to come along cheaper and smaller (with some other tradeoffs), but this was the other desk I was really interested in (other than the Strand Neo, which I decided against because Strand seems to be committing suicide by corporate bureaucracy). Thank TJ, I really appreciate it! Yes, I remember you looking into this board yourself awhile back and ending up with your SmartFade ML. 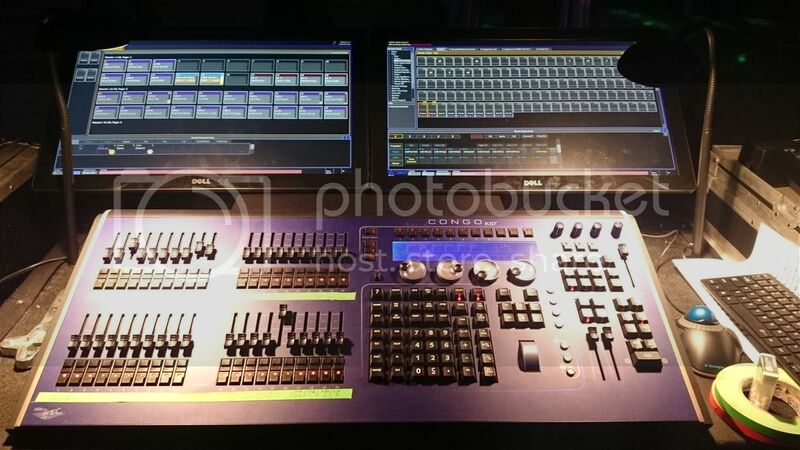 It's just amazing to see how much the "average" light board has evolved over the past decade. Even though I'm personally not a huge fan of the M-Touch (tried as I might I just can't come to accept the touch strips as a fader alternative), had that been an option for me 10 years ago that's the route I would have gone instead of MagicQ + Eurolight. There's certainly no argument that M-PC + M-Touch is the cheapest widely-accepted product on the market right now to get you beyond the DMX Operator/Obey type of boards. I agree about Strand too. Short of a few one-off experiences it's been quite a while since I've worked on a Strand console and I don't miss it. I'll just be curious to see if Cobalt has a future now with ETC owning the Hog series of products too... Time will tell! Thanks again! Thanks for the great review on the Congo Jr. I've been a very happy Congo (Senior) and Cobalt user for over 10 years now. The ease of use and the versatility of the software and hardware for both busking and Theatre shows is unrivalled in my opinion. Thanks again for raising the profile of these great consoles! Thanks Ric! Glad you enjoyed it and it's always nice to find another fellow Cobalt user out there!